Well… I got my new Point & Shoot camera, a Canon S120. After my bad Lumix went belly-up in a simple puff of steam, my new camera was put to it’s first test via steamed curried mussels. It took picture after picture and it just said… ‘ooh, stretch my shutter’. I love mussels. We usually make them the traditional method, with white wine, scallions, broth, etc. I felt like something a little zippier. The Slanted Door cookbook has a wonderful looking curried mussel recipe. I looked at the long list of ingredients (and the clock) and decided to make my own. Making your own curry from scratch isn’t hard… yes, it’s a lot of ingredients and prep, but mostly just chopping, grinding, and simmering. That being said, I find opening a can of Thai curry paste that has all the ‘stuff’ to be very easy and delicious. 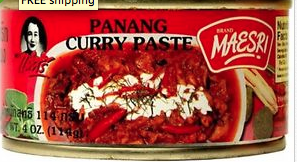 I like the Maesri brand Panang red curry paste. Ironically I still added a lot of ‘stuff’ to it. I started off by sautéing chopped onion, garlic, and ginger while my husband cleaned the mussels (my hero). Then I put the whole can of curry paste in my large wok with the sautéed onions. I added a can of coconut milk + 1 c. chicken broth. Then I added some kaffir lime leaf (I keep in a bag frozen in the freezer), 1 lemongrass stalk, chopped into 6 large pieces (I also keep in the freezer), 1 c. grape tomatoes cut in half, and a 1/2 bunch chopped cilantro. I squeeze 2 limes into the broth to bring the balance out. I tasted it and it was spicy deliciousness. You don’t have to put all the additives in… but I had them available, and they add a brightness to the broth. If you don’t like it hot cut back on the curry paste and keep the remainder in a jar in the refrigerator for another use. By the time the curry broth had come to a full simmer for several minutes, the mussels were ready to take a warm bath. Oh, my. What a great dish. We couldn’t stop eating them. Absolutely delicious and wonderfully flavorful. 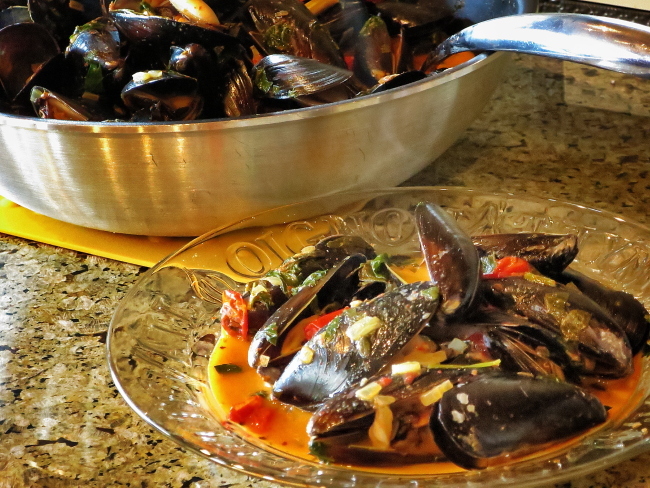 This entry was posted in What's For Dinner and tagged asian, curry, mussels, shellfish on May 2, 2015 by kritterspaw.